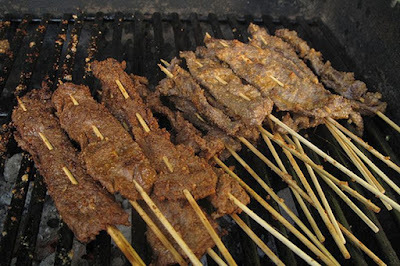 A 35-year-old man, Alliu Abdullai, who sells barbecued meat, popularly called Suya, has been arrested over attempt to murder a four-year-old child, who was abducted at White Sand Market, Otto, Ebute Meta area of Lagos State. Eyes Of Lagos gathered that, Abdullai was alleged to have abducted the toddler from her unsuspecting mother’s shop weekend. Thereafter, he reportedly took him to his Suya stand, where he took his knife and attempted to slash the toddler’s throat. However, a man reportedly accosted Abdullai and immediately raised the alarm. During the struggle to rescue the knife from Abdullai, Police said he inflicted a cut on the good Samaritan. Lagos State Commissioner of Police, Fatai Owoseni, who paraded the suspect alongside his two relatives, at the Police Officers Mess, Ikeja, yesterday, said: “The child has been reunited with her mother, while the kidnapper and would-be murderer will be arraigned in court.” However, when approached, the suspect could only mention his name, but could not express himself in English Language.